If anyone thought on the 19 September last year that peaceful days lay ahead in Scottish politics, they have been proved wrong by the pace and scale of events over the past twelve months. A new First Minister, the first all-party commission on Scottish devolution, a highly dramatic general election. We’ve seen some big changes in Scotland as a consequence of the referendum. But my case today is that those changes are aftershocks of the referendum, and not – as some have argued – a symptom that independence is inevitable. Far from it. The result of the referendum – by over ten percentage points on the highest turnout of modern times at 85% – demonstrates that support for the United Kingdom is broad and deep in Scotland. Nothing that has happened since that decisive result makes independence inevitable. What the referendum did make clear, however – and what the SNP’s success in the general election underlines – is that independence is possible and that the pro-independence message has resonance. The conclusion to be drawn by all who support the United Kingdom and Scotland’s place in it is that we cannot take anything for granted. We must commit ourselves to making the positive case for the Union just as frequently and just as passionately as those who support independence make their case. So intense an experience was the referendum for Scotland, even though it was held a year ago, we are still living in its wake. Everything that has happened in the last twelve months in Scottish politics can only be understood in its context. We are living through what you might call a ‘post-referendum era’. Having knocked on thousands of doors and spoken to people across Scotland during that incredible summer, I don’t think the intensity of the referendum campaign – and particularly its final weeks – will ever be recaptured. It presented, for the first time in most people’s lives, a stark, binary choice at the ballot box. A fork in the road with people in Scotland invited to indicate which of the two paths they wanted to go down. For many, that meant grappling with some fundamental questions. Some, on both sides, only realised how strongly they felt, when the question was put to them. After so significant a shared national experience, it was never going to be straight back to business as usual. And with no break between the referendum campaign and the general election campaign, the two effectively merged. Many people who had been wearing Better Together or Yes Scotland badges one week, donned blue, red or yellow rosettes the next week, without missing a beat. The historic decline of Labour in Scotland, which has been on-going for some time and painfully visible since 2011, combined with the collapse of the Liberal Democrats across the UK. The success of the SNP in translating a large chunk of highly motivated Yes voters, some who had never voted before, into new SNP supporters. And our Westminster voting system, which means that if a party’s support exceeds a certain point a landslide ensues. She could not have been clearer. We should remember over the next four and a half years that my 56 SNP colleagues in Westminster may represent a political triumph for the SNP, but they do not represent a desire for independence. So yes the SNP are riding high, and yes some other parties face challenges. That’s politics. But none of that changes the reality of the referendum result, still less does it make independence inevitable. That’s why the current debate around a potential second referendum is so misguided. Every day we read a new headline about the terms and the timing of a potential re-run of a vote we had less than a year ago. I think we should put this into perspective. Nicola Sturgeon herself signed the Edinburgh Agreement – which committed both of Scotland’s governments to respect the outcome of the independence referendum. We used to hear a lot about that Agreement from leaders of the Yes campaign before the referendum, but we’ve heard very little about it since. Both the First Minister and her predecessor repeatedly asserted that the referendum would be a ‘once in a generation’ or a ‘once in a lifetime’ event. If the result had been a Yes victory by one vote on half the turnout, then the they would have interpreted that as the sovereign will of the Scottish people and any talk of re-run would have been a denounced as a betrayal. In the event – lest we forget – it was a clear No victory by 384,000 votes. More Scots voted to keep our United Kingdom together than have ever voted for any party at any election in the history of Scotland. And yet less than a year later, the Edinburgh Agreement is never mentioned by the them. The sovereign will of the Scottish people is set aside as though it counted for nothing and the First Minister openly acknowledges that she’ll try to hold a second referendum just as soon as she thinks she has a chance of winning it. It is as though the votes of 2 million Scots can just be set aside as an unfortunate but peripheral setback on the road to independence. It is quite clear that this is out of step with what most Scots want, as the extensive YouGov poll last weekend demonstrated. That poll indicated continued support for Scotland’s place in the United Kingdom and clear opposition to a second referendum. We’ve had our say, and we want to get on with our lives. But for those us who support the United Kingdom, that has to mean making the positive case for the United Kingdom. Making the case for the Union has not always come naturally for those who support Scotland’s place in it. I know the vast majority of Scots, of whatever viewpoint, want what’s best for their country. For Scottish National Party members, achieving Scottish independence is the way to deliver that and securing independence is, and has always been, their prime political objective. For most people on the No side, the reverse has been self-evident. We have thought that the benefits Scotland gains from being a part of the United Kingdom were so self-evident that we didn’t really need to point them out. Many thought it was a given – but the referendum campaign changed all that. There’s no doubt that there was a cultural complacency in the years and decades leading up to the referendum, in contrast to the increasingly laser-like and professional focus of those advocating independence. They would leave no stone unturned and no opportunity untaken to further their pro-independence and anti-UK message. Our priority might have been just to get on with the job of demonstrating the benefits of the Union and not to say too much about it. But that approach only leaves the space clear for others to twist and distort what the Union is. We cannot assume that because the referendum was won, we can stop making the positive case for the UK. I make no apologies for making that case to you today. I believe that if the Union didn’t exist, we’d simply have to invent it and yes, people would vote to join it. For three hundred years, Scotland has flourished at the heart of our United Kingdom. As a direct result of our Union with the rest of Britain, Scotland punches above her weight and has a truly global reach. It is as part of that family that Scotland has made such an enormous contribution to the political life and economic prosperity of the UK and the world. And we must never forget that the people who benefit the most from the United Kingdom are not the strong and the successful, but the poorest, the weakest, and the most vulnerable. Not just here at home, but around the world. Scotland joined the Union as a fully-fledged nation state which had for centuries possessed its own Monarch and Parliament. It exchanged ambassadors with other states, had an army and a Navy. In joining the Union, Scotland began to share some of these things with its neighbours. But Scotland within the UK also kept many important separate institutions like our own church, legal code and courts, school system and universities. So Scotland’s unique identity has always been respected within the United Kingdom. And the way Scotland has governed itself within the UK has evolved over time, with administrative devolution and the creation of the Scottish Office in 1885 and of course the creation of our devolved Scottish Parliament in 1999. So the story of Scotland’s membership of the United Kingdom has been one of individuality, evolution and adaptation. And that continues to this day. Membership of the UK is a double win for Scotland – it combines the security and stability that comes with membership of a larger state with the freedom, distinctiveness and individuality of a smaller nation. Freedom to run our hospitals, schools, police stations and courts as we decide. And complete confidence that we have full access to all of those services anywhere else in the UK too. Scotland retains its own unique identity which is cherished and admired the world over, while also being part of something bigger that is also cherished and admired. The advantages Scotland enjoys by being part of something bigger were plain when an unprecedented number of Scots voted to endorse Scotland’s UK membership in the referendum last year. And they have become even clearer in the twelve months since. The BBC has continued inform, educate and entertain across the UK with world-class television and radio. The UK Security Services have continued to keep citizens across the UK safe and secure. And the UK’s Department for International Development, with many of its dedicated officials based in East Kilbride, has continued to save and transform lives around the world. The pound sterling, one of the oldest and most stable currencies in the world, has continued to provide Scotland with the safety and security which some countries in the Eurozone so patently lack. In the last twelve months every person in Scotland has benefited from the lower taxes and higher public spending which Scotland enjoys by virtue of its membership of the wider United Kingdom. We estimate this to be worth £1,400 per person per year for everyone in Scotland. And one crucial area where the broad shoulders of the United Kingdom have benefited Scotland in the last year has been over the price of oil. As the global oil price has slumped from $110 a barrel to under 50 dollars since the referendum – and the Scottish Government’s wildly optimistic projections have been totally disproved – the economic shock-absorber of being part of the United Kingdom has been invaluable. It has meant that public spending in Scotland, which supports many of the most vulnerable people in Scotland, has been insulated from the shock of that slump in oil prices. And business has continued to prosper as part of the United Kingdom. With no international border to hold them back, Scottish businesses have continued to trade more with England, Wales and Northern Ireland than with the rest of the world combined. Around the world, the UK’s extensive overseas network has continued to promote Scottish exports like Scotch whisky, which continues to grow in popularity around the globe. And dedicated UK diplomats and officials have supported and looked after Scottish citizens overseas, including in the wake of the tragic attacks in Tunisia earlier this year. Scotland has continued to benefit from the UK’s terms of EU membership: keeping the UK pound; maintaining a separate free travel area; and retaining a rebate that saves more than £3 billion a year on payments to the EU. And also, defence. One of the largest employers in Scotland, supporting around 12,600 highly-skilled industry jobs. Scotland has remained an integral part of the UK’s defence and security arrangements – defending shared airspace, patrolling the surrounding seas and helping to protect everyone in the UK against threats. All these benefits and many more are why so many Scots were delighted and relieved by the referendum result – not because our side had won, but because we had got the right outcome for everyone in Scotland. We used to take these things for granted. The referendum campaign taught us that we cannot afford to do so. So, a history of successful evolution and flexibility within the Union, with further changes on the way. Clear and compelling evidence that membership of the United Kingdom is in Scotland’s best interests. And I think something even simpler played its part. Basic intuition. It just makes sense to be a part of the things that influence you. It makes sense to be on the team. To have a voice and to have a say. The funny thing is, these are exactly the arguments I expect supporters of independence to deploy in the European Union referendum campaign which will take place before the end of 2017 – but they reject them when applied to the far more relevant example of the United Kingdom. And because we recognised that a ‘No’ vote was not a vote for no change, we committed to delivering more powers to the Scottish Parliament. We have met every deadline in preparing, bringing forward and now legislating to give more powers to the Scottish Parliament. The ‘Vow’ did not, as some suggest, alter the outcome of the referendum – the result was far too decisive for that. All the evidence shows that it was the lack of a credible economic argument for independence that swayed people most. The fact that no such credible or compelling economic argument has appeared in the last twelve months only goes to reinforce that independence is by no means inevitable. But the Vow did reaffirm our commitment to a Scottish Parliament which is more responsible and accountable to the Scottish people. In the Smith Commission, all five main parties in Scotland, including the SNP came to the table and reached agreement on the proposals for further devolution to Scotland within the United Kingdom. 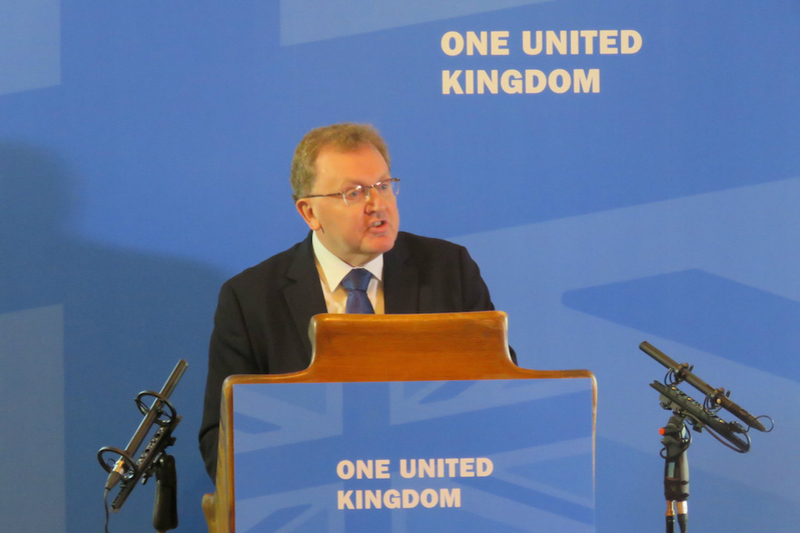 It was informed by thousands of submissions from the public and civic Scotland and by the extensive proposals which the pro-UK parties had already put forward. This was the first time that all of Scotland’s main parties have taken part in a process to decide the future of devolution. And the agreement was signed up to by all five parties. The Scotland Act 2012 is already increasing the ability of the Scottish Parliament to raise revenue by devolving stamp duty land tax and landfill tax, extending borrowing powers and creating a new Scottish cash reserve to help manage the new tax receipts. But the current Scotland Bill, which is passing through Parliament now, will go much further. For the first time, over 50% of the money spent by the Scottish Parliament will be funded by the Scottish Parliament. Scotland will receive extensive new tax powers without losing the essential elements of our unified UK tax system that supports the single market and helps promote competitiveness. With the power to set the rates of Income Tax and the thresholds at which these are paid, Holyrood will gain control of the most significant tax in Scotland. This powerful redistributive tool may be dismissed by Nicola Sturgeon as ‘modest’ – but don’t be deceived. It will be game-changing for political debate in Scotland. Together with the welfare powers, the Scottish Government will have responsibility for taking some of the most emotive and important decisions affecting Scotland – and they will be made in the Scottish Parliament, paid for by revenue raised by the Scottish Parliament. We still need to understand what the Scottish Government intends to do with the new powers. I am pleased that my colleague Ruth Davidson has started that debate, but we need to hear more from the other parties about their plans for taxation and welfare spending. Be in do doubt – the changes being made in the Scotland Bill will mean noticeable changes to the lives of people in Scotland. It is hard to imagine that now, when it’s all just words on a page. But once they are commenced, their true significance will become apparent. People will see those changes and they will prove again that Scotland’s place in United Kingdom is adaptable to circumstance. Independence is not inevitable – but we need to demonstrate the benefits of UK membership and the benefits of the devolution settlement. And that is what the Scotland Bill does. There’s an old joke about asking someone for directions, and them telling you in reply, ‘I wouldn’t start from here’. But just imagine we were designing our constitutional arrangements from scratch, free from the ties of history, family and sentiment. I believe that what we’d come up with as the ideal arrangement for Scotland would look very much like the United Kingdom which this Government’s reforms are building. Trading and working across the Border. With common security challenges and shared international interests. We’d want a system of government which gave us freedom to innovate and express ourselves, combined with the security and safety of a strong partnership. That’s what the United Kingdom provides. If it didn’t exist, we’d want to invent it. That’s what the decisive majority reaffirmed twelve months ago. They were right then, they are right now and it is right for the future.